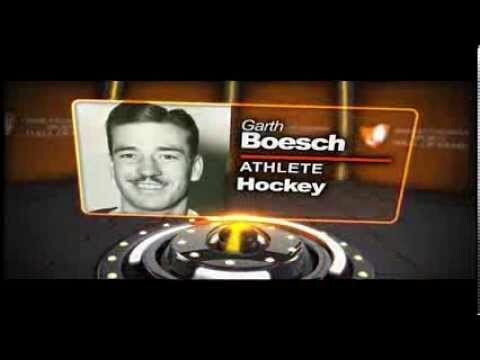 Garth Boesch began attending Notre Dame College in Wilcox in 1937.Playing as a right winger, he spent three years at Notre Dame. In that time, he scored seventeen goals in twenty-nine games. He finished his schooling at Notre Dame determined to take his hockey playing to the next level. In the 1940/41 hockey season, Boesch played as a defenseman on the Regina Rangers of the Saskatchewan Senior Hockey League. Though he didn’t put up many points, he became known as a tough player who could keep the other team from scoring. He helped the Rangers win the league championship, then the Western Championship, and finally, the Allan Cup—making them the best amateur senior hockey team in the country. Boesch was playing with the Rangers again during the 1941/42 season when he was drafted into the Canadian Armed Forces. He was stationed in Lethbridge, AB, where he continued to play with an armed services team in the Alberta Senior Hockey League, the Lethbridge Bombers. In the 1942/43 season, he was named the league’s Most Valuable Player. Boesch was discharged from the Royal Canadian Air Force at the end of the Second World War, meaning he was now free to pursue a career in the National Hockey League. In the 1945/46 season, Boesch played with the Pittsburgh Hornets, the farm team of the Toronto Maple Leafs. In Pittsburgh, he scored twenty-four points in forty-three regular season games and eight points in six playoff games. His hard-nosed play impressed Leafs’ coach Conn Smythe, and earned him a spot on Toronto’s roster the following season. As a Maple Leaf, Boesch was considered to be one of the team’s better defensemen. While he didn’t contribute a great number of points with the team (nine goals and twenty-eight assists in one hundred ninety-seven regular season games), he was an exceptional “stay-at-home” defenseman. Boesch was a key part of the Maple Leafs’ Stanley Cup victories in 1947, 1948, and 1949. In both the 1947/48 and 1948/49 seasons, he played in the NHL All-Star Games. Upon the death of his father in 1950, Boesch chose to retire from the NHL and return home to take up the family farm. Installed in the Saskatchewan Sports Hall of Fame on June 15th, 2013.